Today is the Solemnity of the Birth of St. John the Baptist, the patron saint of our parish here in Healdsburg. In the graces of Christ shared in the Communion of the Saints we can ask St. John what he would share with us today, over 2000 years since he first sought to “prepare the way of the Lord”. I sense his message would be essentially the same, yet with an added urgency. As we struggle in this age of information inundation and sensory addiction St John would probably call us to..repent and seek the Kingdom of Christ. That is, he would urge us to slow down…simplify and listen to the Holy Spirit, through God’s Word, through His Church, through, even the quietness of God’s creation. With the same fire of holy love that drew the crowds to him in Judea, that same holy love would urge us to listen to, to know, to receive and follow Christ. In the pattern and simplicity of John’s life we can know the pattern and path to ON-GROWING faith and communion with our Lord. John proclaimed the Word of God..the Gospel in his words but even more profoundly in his life. Yet his message was to prepare the way of the Lord. Baptizing Christ in the Jordan John would, in essence, share Christ, God’s Son, in the flesh with the world. The world would come to realize in the course of Christ life, death and resurrection the grace and call to know..receive Christ, The Living Word of God and His Sacred Body and Blood..to receive and grow to be..the Body of Christ, His Church. The simple ministry of John would be a precurser to the liturgy we celebrate at Mass. As we gather we renew our commitment to be a people alive in the Spirit of repentance, with the penitential rite. This is followed by the Liturgy of God’s Word where we listen to Scripture from the holy roots of the Old Testament through the Psalms, the New Testament Epistles and the crowning grace of the Gospels. With God’s Word proclaimed we then confess our faith anew and share, as God’s children, our prayers. It is then we bring to His Altar our gifts and share in the mystery and miracle of knowing the bread and wine consecrated by the power of the Holy Spirit into the very Body and Blood of Christ as He Himself promised in the Gospels. From this rich feast of God’s Kingdom we are renewed and empowered to grow on to share the Ways of the Lord. 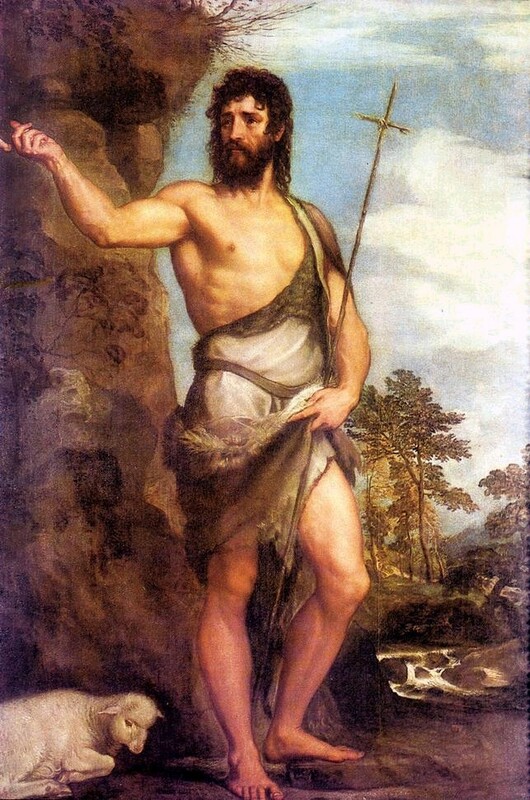 This day, remembering, reflecting with St. John the Baptist, may we each seek and follow Christ in the power and mercy of His holy love.